At Harbour Station the Facility is adapted to accommodate the requirements of each Event Promoter from small mini bowl concerts to 50,000 square feet of unobstructed floor space, two inches of Figure Skating ice to 1000 cubic yards of dirt for Monster Trucks; we do our best. Harbour Station has the capacity to make ice in 40 hours and take it out in 3 hours. For most ice events, 1 inch of ice is required for optimum performance but figure skating requires an extra inch for safety. Ice temperatures also differ from event to event. The concrete ice deck at Harbour Station is NHL regulation size and measures 200 feet long by 85 feet wide. The concrete is 6 inches thick and has 1 inch plastic piping, every 4 inches embedded lengthwise. In this 9 miles of piping a brine (salt water) solution is circulated. In the mechanical refrigeration plant this brine is chilled to temperatures of around -15 degrees Celsius. Once the ice plant is started, over time the concrete drops in temperature and once below freezing, water when applied to the concrete, will freeze. At this point the concrete is painted white and all the hockey lines and advertising logos are painted by hand. The logos are huge paper stencils with cut perforations around the design. The paper is layed on the ice and chalk is lightly spread all over the stencil. 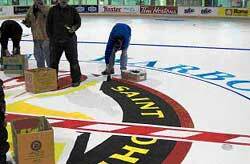 The paper is then lifted, leaving an outline of the logo on the ice and using paint and brushes the logo is painted. Afterwards water is slowly added (totaling about 10,000 gallons) and over 12 hours of flooding one inch of ice is on the concrete and skating can commence. The water used in flooding goes through a special process called "demineralization" where all the dissolved solids are removed. This removal of the impurities enables the water to freeze at a higher temperature saving energy as well as providing a faster surface area for the skate blade to glide over the ice. 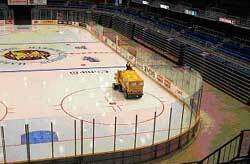 This process is known as "Jet Ice" and is a standard in professional arenas. • Curling - 21 degrees F Harbour Station has ample capacity in the refrigeration plant, the building climate control systems and state of the art computer management, to be able to maintain ice surface temperatures to within one half of a degree F.
•	Then, over 2 days the rinks were individually flooded to gradually make them perfectly level from one end to the other. •	The icemakers then would pebble, shave and maintain the ice as necessary for the start and duration of the tournament.